Adams would consider returning to UW for a fifth year of eligibility, a source told The Seattle Times. Washington senior left tackle Trey Adams is expected to miss significant time — perhaps the entire 2018 season — with a back injury that kept him out of the Huskies’ season-opening loss to Auburn on Saturday. If he does miss the majority of the season, Adams would consider returning to UW for a fifth year of eligibility, a source told The Seattle Times. A preseason All-American, the 6-foot-8, 316-pound Adams missed the second half of the 2017 season after suffering a torn anterior cruciate ligament in his right knee. He had been on track to return from the knee surgery last month until the back injury surfaced early last week. He did not travel with the team to Atlanta. After the game on Saturday, UW coach Chris Petersen did not sound optimistic about Adams’ long-term prognosis. Petersen did not have an update on Adams’ status during his weekly press conference Monday morning. Junior Jared Hilbers made his first career start against Auburn at left tackle and played every snap on Saturday. 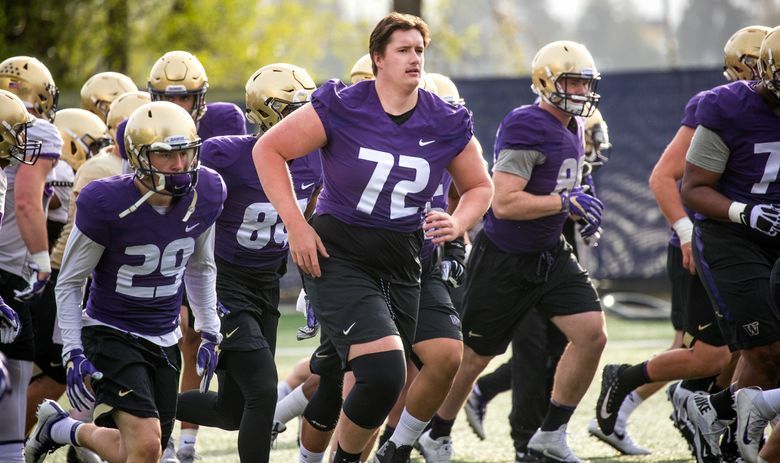 He’s listed as the starter for the Huskies’ home opener against North Dakota on Saturday (2 p.m., Pac-12 Network), with junior Henry Roberts listed as the backup at left tackle. Hilbers wasn’t the only first-time starter on UW’s offensive line against Auburn. In his collegiate debut, redshirt freshman Jaxson Kirkland played every snap at right guard Saturday. Petersen was generally pleased with how the O-line played against what he called one of the best defensive fronts in the country.